Modifications: I used duplicate stitch and these wonderful alphabet charts to add the name of each giftee on the cuffs of the stockings. After the first try, I doubled the strand of yarn for the duplicate stitching to make the name stand out more. 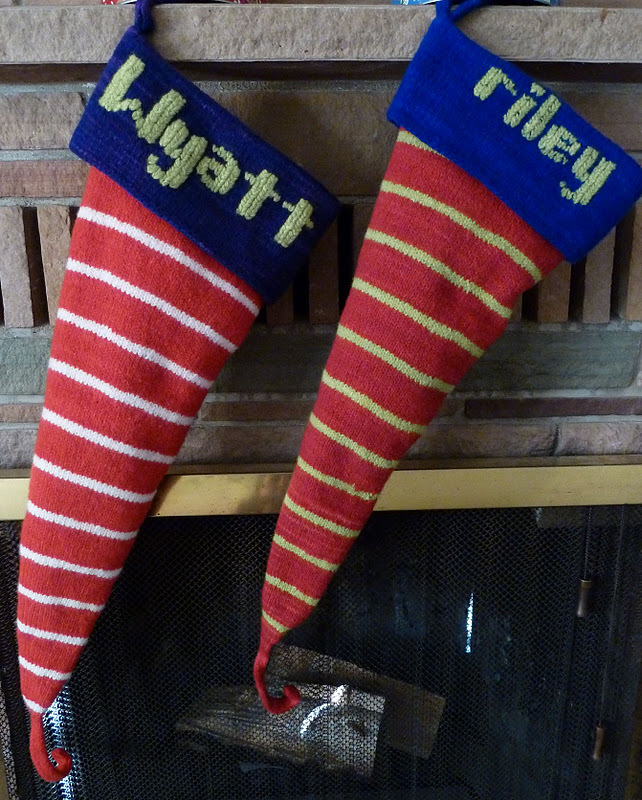 I used a double strand to stitch the name on the stocking on the left. I realize January 13th may be a little late to be posting about these, but as I mentioned on Wednesday, I'm still knitting some of these. It's never too early to start getting ready for Christmas 2012! I thoroughly enjoyed knitting and felting these. Leigh Radford has come up with a pattern to appeal to the knitter who wants to make a less traditional stocking. I can easily imagine these fun stockings hanging on the mantels of Whoville. The book includes instructions for the stocking in 2 sizes. My family members wanted the larger ones. You can see below how the larger size compares to our store-bought stockings. More room for treats and gifts! AlterKNITS Felt includes many other intriguing felted patterns, and a very informative section on the ins and outs of felting. I borrowed the book from a friend to make the stockings and now I think it would be worth owning a copy for myself. I hope everyone has a great weekend! I know I will spend part of mine perusing knitting blogs at Tami's Amis FO Friday link party. Join in the fun here. Such a cute pattern, and you're absolutely right about them looking perfect for Whoville! The stockings are beautiful! I love the stripes. Love these! I was thinking about crocheting new stockings for the family this year, but Christmas gift crafting got in the way. I might have to make some this summer instead...too cute! I ordered the book! I love felting and it sounded pretty interesting. I have free shipping for a month so that was another incentive. Love that stocking! Great stockings! Thanks for the link to the alphabet chart. It will definitely come in handy. I am in love with these stockings! Were the duplicate stitched letters done before or after you felted? Could it be done either way?